I have the dubious distinction of owning the largest bill in the history of the Life Center, a Leesburg emergency and critical care veterinary center. 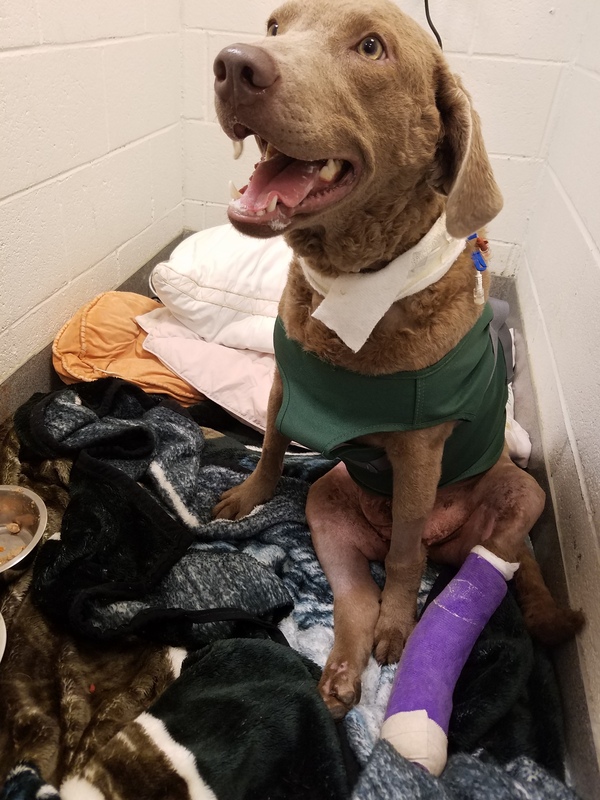 In just 30 days, costs of surgeries and care to repair the injuries of a young dog that was hit by a car in a freak accident have exceeded $55,000. Yes you read that right. In some places that sum would buy you a house. Here, it wouldn’t, and as I keep telling myself, you can’t take it with you. And although my injured pup is out of critical care and now home, she still faces one more major surgical procedure to repair the worst of her injuries. But because the costs dribbled in $5,000 at a time over the initial estimate of approximately $20,000, and a fierce fighting spirit that never backs down from a challenge (the pup’s, not mine), she is still here. I, however, have had to liquidate a retirement fund, go back to work from a well planned retirement, and am now facing the soul searching of asking myself if it would have been better to let her go. Had I known going in what this would cost, the multiple painful surgeries the pup would face as well as the likely outcome, I would have opted for euthanasia. But 5 weeks into her rehabilitation, it’s not an option: I would still be out that hideous amount of money, and for nothing. 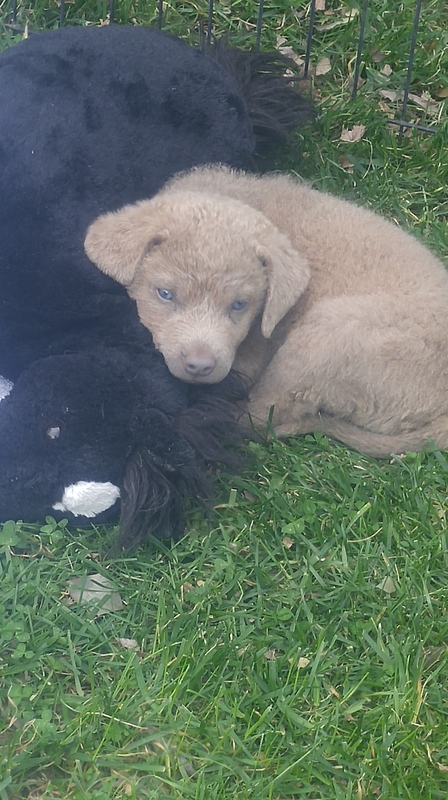 The Poltroon, the injured pup, is a young Chesapeake Bay Retriever, the 9th generation of my own small breeding program begun in 1985. For the past 10 years, I’ve been actively campaigning my Chesapeakes in AKC hunting tests and field trials, along with the occasional show and obedience trials; the 4 generations before the Poltroon titled in all 3 venues. At 18 months, the Poltroon showed great promise and had just come back home from spending a few months with the nation’s top young dog field trial trainer. There, she had been prepping to run derbies in hopes of starting a field trial career. Further, in a breed with small numbers and an even smaller gene pool for champion dogs, hers is an unusual and scarce bloodline that has produced some very good dogs. But she will never be sound enough to compete; her broken body would never hold up to the training needed. Emotionally, I have a strong attachment to the Poltroon as well. She is the product of a highly anticipated breeding that resulted in a one-puppy litter. As is the case with most singleton puppies, she had to be delivered via C section. And from the moment her dam woke up from the anesthesia, she viewed her pup as the spawn of the devil and wanted nothing to do with her. In fact, she had to be forcibly restrained so the pup could nurse. By the second day, her milk dried up, out of meanness I guessed, although it’s a common occurrence with a single puppy litter. So I bottle raised her—that meant taking her everywhere with me the first six weeks of her life. Because she had no mother or siblings to teach her important social skills, she was a willful and difficult pup. Not mean, but nippy and challenging. If she was a person, she’d probably have a police record for juvenile delinquency. Her basic training took twice as long as most pups I’ve raised. She was and continues to be a fighter, and that is the reason she is still alive. The Poltroon’s worst injuries included several pelvic fractures, dislocation of both hips, a broken femur and a large hernia from a tear in her stomach wall along with a badly damaged hock. Within 5 days, she’d had four major surgeries: a plate put in her left femur to repair that break, two more plates and screws to fix the pelvic fractures, all held in place with a toggle rod stabilization gizmo. The stomach wall tear and hernia was repaired with mesh. Through all these surgeries she has shown a fierce determination to recover and get back on her feet; she rebounded from the accident and each surgery amazingly quickly. But the right side pelvic fracture was worse than it initially appeared, since it was a compound fracture of the socket. Unfortunately, after this was repaired, the femur would no longer fit in the socket and kept dislocating—the Poltroon was a victim of her own excellent hips, deep sockets with perfectly fitted femoral heads. So the repair to her right socket meant she’d need a femoral head osteotomy, or FHO, where the ball of the femur was cut off. Otherwise, she would not be able to stand. Of all her procedures, this one was, perhaps, the hardest to accept. Many small dogs and cats are fine after an FHO, but it is rare a large breed dog can return to full function after this procedure. So the Poltroon’s FHO meant there was now no hope of ever being able to compete or probably even hunt. At this point, the aim is for a moderately normal life as a farm pet. She is home now, and attacking her rehab the way she has attacked everything else in her life: head on and with gusto. Fortunately I do not have children nor any other financial dependents and am healthy enough to go back to work; some of the money was a nest egg for a new truck to replace my 2002 Chevy that, with 240,000 miles, is on borrowed time. I’ll just have to hope to borrow more time and hope for the best. My crippled dog and I wish you all a Merry Christmas; we’ll be serving oodles of noodles and Ole Roy. « Barney Barnwell is Passin’ It On! An amazing story! Continued prayers for her recovery. We are all looking forward to the Poltroon recovering! She is a special pooch! Thanks for reading us. Be sure to follow us on Facebook! Polty and you are a great pair. She is so worth it 😉 The love you two have is very special. I hope Poltroon recovered, healed, and rehabilitated to continue living with gusto.